Back to Basics: Kingsolver Clan Lives off Land In a departure from her popular novels, author Barbara Kingsolver takes her family back to its roots in Appalachia to live off the land for her latest book. The clan learns to "eat deliberately." Clockwise from left: Author Barbara Kingsolver with her husband Steven L. Hopp and daughters Camille and Lily. They spent a year eating locally and home-grown food. In her newest book, Barbara Kingsolver departs from the route taken in popular works of fiction like The Poisonwood Bible and The Bean Trees, to tell the true story of going back to her roots in Appalachia. 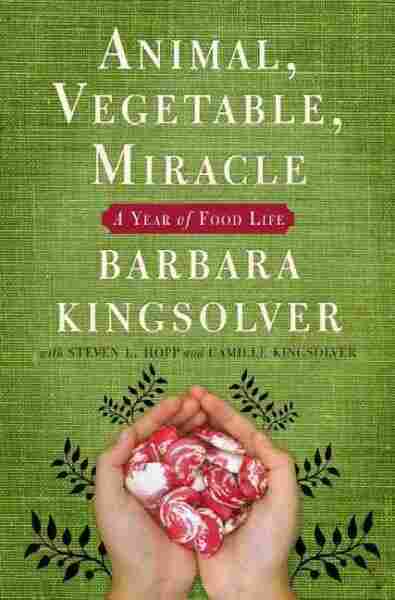 In Animal, Vegetable, Miracle: A Year of Food Life, Kingsolver and her family conduct an experiment in what she calls learning to "eat deliberately." That means eating only seasonal local foods, or food they've grown themselves. 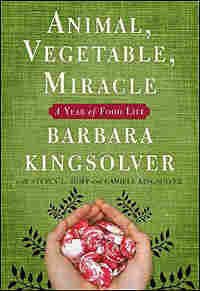 The family leaves their home in Tucson, Ariz., and heads to Kingsolver's family farm in Virginia to live off the land. The clan grows a large garden and spends the summer storing food, jarring tomatoes, braiding garlic and stuffing turkey sausage. Along the way, the family discovers the pleasures of eating naturally raised meat. Kingsolver's family did more than live the story; they also contributed to the book. 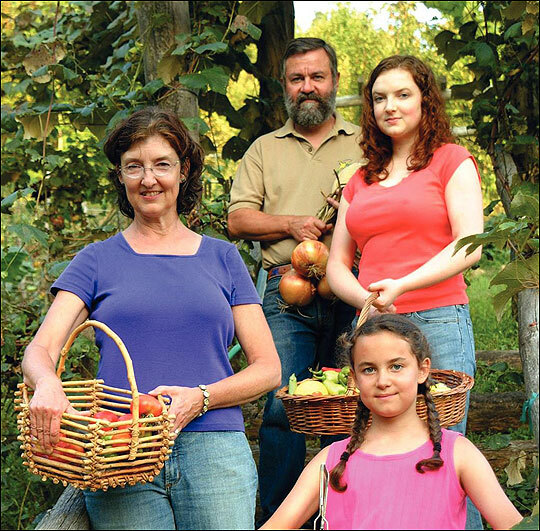 Her husband, Steven Hopp, writes about industrial agriculture and ecology, and her daughter, Camille, adds flavorful recipes. Lynn Neary speaks with Kingsolver and Hopp about their experiences. This story about good food begins in a quick-stop convenience market. It was our family's last day in Arizona, where I'd lived half my life and raised two kids for the whole of theirs. Now we were moving away forever, taking our nostalgic inventory of the things we would never see again: the bush where the roadrunner built a nest and fed lizards to her weird-looking babies; the tree Camille crashed into learning to ride a bike; the exact spot where Lily touched a dead snake. Our driveway was just the first tributary on a memory river sweeping us out. One person's picture postcard is someone else's normal. This was the landscape whose every face we knew: giant saguaro cacti, coyotes, mountains, the wicked sun reflecting off bare gravel. We were leaving it now in one of its uglier moments, which made good-bye easier, but also seemed like a cheap shot—like ending a romance right when your partner has really bad bed hair. The desert that day looked like a nasty case of prickly heat caught in a long, naked wince. This was the end of May. Our rainfall since Thanksgiving had measured less than one inch. The cacti, denizens of deprivation, looked ready to pull up roots and hitch a ride out if they could. The prickly pears waved good-bye with puckered, grayish pads. The tall, dehydrated saguaros stood around all teetery and sucked-in like very prickly supermodels. Even in the best of times desert creatures live on the edge of survival, getting by mostly on vapor and their own life savings. Now, as the southern tier of U.S. states came into a third consecutive year of drought, people elsewhere debated how seriously they should take global warming. We were staring it in the face. Away went our little family, like rats leaping off the burning ship. It hurt to think about everything at once: our friends, our desert, old home, new home. We felt giddy and tragic as we pulled up at a little gas-and-go market on the outside edge of Tucson. Before we set off to seek our fortunes we had to gas up, of course, and buy snacks for the road. We did have a cooler in the back seat packed with respectable lunch fare. But we had more than two thousand miles to go. Before we crossed a few state lines we'd need to give our car a salt treatment and indulge in some things that go crunch. This was the trip of our lives. We were ending our existence outside the city limits of Tucson, Arizona, to begin a rural one in southern Appalachia. We'd sold our house and stuffed the car with the most crucial things: birth certificates, books-on-tape, and a dog on drugs. (Just for the trip, I swear.) All other stuff would come in the moving van. For better or worse, we would soon be living on a farm. For twenty years Steven had owned a piece of land in the southern Appalachians with a farmhouse, barn, orchards and fields, and a tax zoning known as "farm use." He was living there when I met him, teaching college and fixing up his old house one salvaged window at a time. I'd come as a visiting writer, recently divorced, with something of a fixer-upper life. We proceeded to wreck our agendas in the predictable fashion by falling in love. My young daughter and I were attached to our community in Tucson; Steven was just as attached to his own green pastures and the birdsong chorus of deciduous eastern woodlands. My father-in-law to be, upon hearing the exciting news about us, asked Steven, "Couldn't you find one closer?" Apparently not. We held on to the farm by renting the farmhouse to another family, and maintained marital happiness by migrating like birds: for the school year we lived in Tucson, but every summer headed back to our rich foraging grounds, the farm. For three months a year we lived in a tiny, extremely crooked log cabin in the woods behind the farmhouse, listening to wood thrushes, growing our own food. The girls (for another child came along shortly) loved playing in the creek, catching turtles, experiencing real mud. I liked working the land, and increasingly came to think of this place as my home too. When all of us were ready, we decided, we'd go there for keeps. We had many conventional reasons for relocation, including extended family. My Kingsolver ancestors came from that county in Virginia; I'd grown up only a few hours away, over the Kentucky line. Returning now would allow my kids more than just a hit-and-run, holiday acquaintance with grandparents and cousins. In my adult life I'd hardly shared a phone book with anyone else using my last name. Now I could spend Memorial Day decorating my ancestors' graves with peonies from my backyard. Tucson had opened my eyes to the world and given me a writing career, legions of friends, and a taste for the sensory extravagance of red hot chiles and five-alarm sunsets. But after twenty-five years in the desert, I'd been called home. Recipe for "Eggs in a Nest"
Two cups uncooked brown rice — Cook rice with four cups water in a covered pot while other ingredients are being prepared. Olive oil – a few tbsp; 1 medium onion, chopped; garlic to taste — Saute onions and garlic in olive oil in a wide skillet until lightly golden. Carrots, chopped; ½ cup dried tomatoes — Add and saute for a few more minutes, adding just enough water to rehydrate the tomatoes. One really large bunch of chard, coarsely chopped — Mix with other vegetables and cover pan for a few minutes. Uncover, stir well, then use the back of a spoon to make depressions in the cooked leaves, circling the pan like numbers on a clock. Eight eggs — Break an egg into each depression, being careful to keep yolks whole. Cover pan again and allow eggs to poach for three to five minutes. Remove from heat and serve over rice. From Animal, Vegetable, Miracle by Barbara Kingsovler with Steven L. Hopp and Camille Kingsolver. All rights reserved. No part of this book may be used or reproduced without written permission from HarperCollins Publishers.